Bacteria propel themselves with corkscrew tails anchored in rotary motors. That may seem surprisingly mechanical for a microbe, but it is a system that has been wildly popular and conserved across billions of years of evolution. Bacteria that can swim propel themselves with corkscrew tails anchored in rotary motors. That may seem surprisingly mechanical for a microbe, but it is a system that has been wildly popular and conserved across billions of years of evolution. To see what I mean, I encourage you to visit this page. All four videos are worth a look, but pay particular attention to the third. The basic motor design is a rotating driveshaft embedded in a series of rings that act as stators, the stationary part of a mechanical rotor system. The rings are themselves embedded in the cell wall and cell membranes -- the skins of bacterial cells. Most of the rings appear to stabilize the driveshaft, but in one ring near the base (called the MS ring below) are a set of motor proteins that turn the base of the flagellum. References: ,,  (main 3), ,  (propeller rotation), PMID 17142059 (bend).. Licensed under Public Domain via Wikimedia Commons. I should note that the depiction of the flagellum is not right in this image -- it should be shaped like a rigid helix or corkscrew with a fixed wavelength as you saw in the videos, not as a flexible whip. The tails of protists, plants, animals, and fungi are like that, but not bacteria. These proteins get their power from the same chemical gradient that powers the cell itself -- the pumping of of subatomic particles called protons out of the cell by good ol' cellular respiration and the electron transport chain that we all learned about back in high school biology (the mitochondria in your cells, themselves descendants of bacteria, use a nearly identical process to power you. It's what all that oxygen you're so insistent about breathing is needed for). Because the concentration of protons outside the cell is higher than that inside thanks to all this pumping, protons try to re-enter the cell by any means possible. 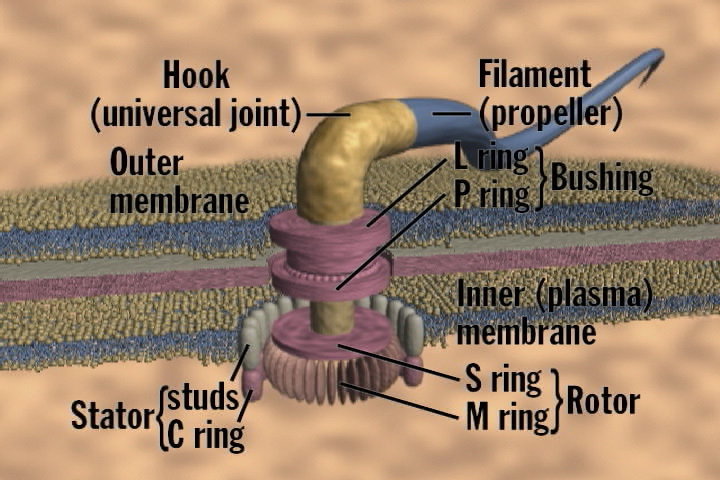 The motor proteins in the MS ring of the bacterial flagellum provide such a pathway and harvest energy from the resultant flow of protons and use it to turn the tail. It's much like a water wheel harvesting the flow of falling water to turn a mill that grinds grain. Calculations show (according to my college microbiology text) that 1,000 protons must pass through the motor protein to power a single turn of the tail. Bacteria can also slow down or step on the gas by controlling the strength of the proton motive force. All this is not to say that every bacterial motor is identical, although this is the impression one gets as a biology student. On the contrary, it appears that there is substantial variation in the details of the motor design, although the core machine is clearly the same. This is not surprising when you consider the enormous span of time over which life has evolved on Earth (well over 4 billion years, by current estimates), and the incredible variety of places that bacteria live and must navigate. A team of scientists from Caltech and the University of Texas set out to get a better sense of that variation by surveying the motor structure of 11 bacteria from a variety of groups. They were surprised by the variation they saw. You can see it for yourself. On the left are the business ends of the bacteria in question showing the base of the tail embedded in the cell wall and membranes. On the right are close-ups of the motors. Fig. 1 from Chen et al. 2011. Click image for source. As you can see, they all use the same motor, just not the same model. The 11 were chosen to represent a variety of habitats and species. Hylemonella gracilis seems to be a free-living aquatic bacterium. Borellia burgdorferi is the agent of Lyme Disease. E. coli is a ubiquitous resident of human bodies but some strains are causers of food poisoning par excellence; so are Campylobacter jejuni and Salmonella enterica. Vibrio cholerae causes cholera. Helicobacter hepaticus is associated with hepatitis and colorectal cancer. Treponema primitia is a spiral bacterium isolated from termite guts, but is also in the same genus as Treponema pallidum, the cause of syphillis. Caulobacter crescentus is a free-living inhabitant of lakes and streams. Acetonema longum lives in termite guts, and Hyphomonas neptunium lives in the ocean, as you'd expect from the name. To give you a sense of where the various parts of the motor are in these images, here is one that breaks down the images into the relevant rings surrounding the driveshaft. Fig. 2 from Chen et al. 2011. Click image for source. The "export apparatus" does just as its name suggests: it exports the proteins that build the tail itself. In the image at top, the export apparatus is also called the "Type III Secretion System". This is a very specific protein complex found in many bacteria; in pathogens, it's often used to inject bacterial toxins into host cells. Here, more or less the same complex forms the core of the bacterial flagellar motor and injects tail proteins into the hollow core of the growing tail. When they reach the end, they spontaneously add themselves to the end of the tail, lengthening it. Here are the parts of the motor highlighted by color in each of the species of bacteria examined. There's a key to the colors at lower right. Fig. 3 from Chen et al. 2011. Click image for source. Now comes a surprise. One would expect that such a complex structure [the bacterial motor] be the product of an uncommon event in evolution, consequently, that it be alike in different bacterial species. Not so. A most exciting detailed analysis of eleven different species shows that although the basic plan is the same, these tiny machines vary considerably in detail. Their elements differ in curvature and in the positioning with regard to the axis. True, the bacteria species chosen included an assortment of their flagellar arrangement, the flagella being polar in some, all over the surface (peritrichous) in others, and in yet others encased in the periplasm [the space between the inner and outer membranes]. One can well imagine that such different arrangements might require specially adapted machinery. But this finding does reveal a great degree of plasticity in the way flagellar motors are made. Isn't this amazing? Thanks, Elio, for inspiring this blog post with yours!